"You are pulling my leg" and "You are pulling my legs". Which is correct? Idioms are expressions with connotative meanings, and one notable feature of idiomatic expressions is that they don't change their forms, regardless of the context. However, there is a good number of idioms which second learners of English have succeeded in changing their forms by adding affixes to some of the words constituting these idioms. A notable example is the idiom "to pull someone's leg", meaning "to tell a lie as a joke", or "tease". In this part of the world where English is being learnt as a second language, the correct form of this idiom is gradually fading out, as you often hear people say, "You are pulling my legs" instead of "You are pulling my leg". The truth is that there is only one leg in this idiom, and no matter the number of legs you have, the "leg" in the idiom remains "leg". Therefore, it shouldn't be altered. In a situation where more than one person is being teased, the idiom is best avoided. Do not say "you are pulling our 'legs'" because of your number. 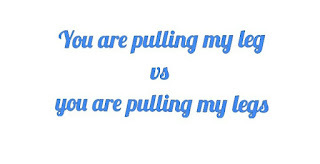 It would really sound strange to say either "you are pulling our leg" or "you are pulling our legs". You can simply say, "You are teasing us". Having said that, let's see how to use this idiom. Wrong usage: You are pulling my legs. I am very sure I didn't pass the interview. Correct usage: You are pulling my leg. I am very sure I didn't pass the interview. It is also important to state that once you change the correct form of an idiom, its grammaticality is lost, and such expression is no longer seen as an idiom. Therefore, you should always use the correct idiomatic expression.